Plans for 400 homes neighbouring an Aberdeenshire beauty spot were labelled “the wrong development in the wrong place” by ardent locals last night. Banchory residents turned out in their droves to Hill of Banchory Primary School for the pre-determination meeting on the proposals for Braehead, Auchattie, south of the Deeside village. 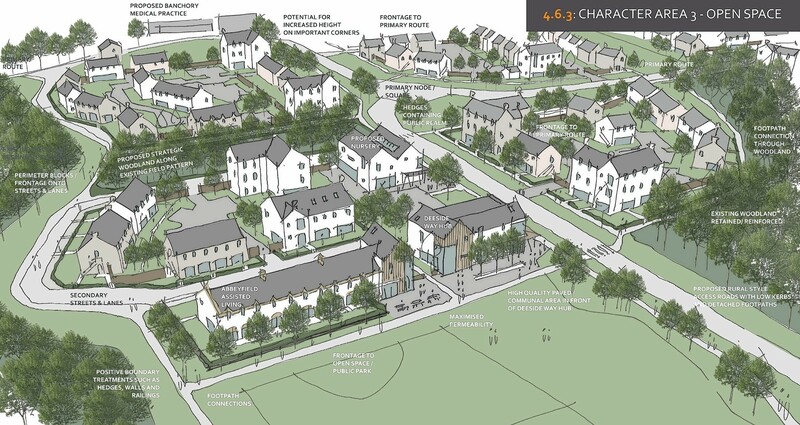 A planning application in principle has been lodged by Turriff-based Sandlaw Farming for 300 rented homes, 75 affordable homes and 25 assisted-living apartments at the spot neighbouring Scolty Hill. However, nearly 500 objections were raised in relation to the site, which also included plans for a “Banchory Medical Centre” and a hub for the Deeside Way. Speaking last night spokesman for Sandlaw Farming, Ken Ross, said the need for affordable homes and rented housing in the Marr area was “a need measured in thousands”. He added: “Aberdeenshire Council has 1,277 families on (their) waiting list in Marr alone, but when families in work ask for rented accommodation in Woodhill House they are told look at alternative options. He added the homes could be delivered as soon as next year, and that a two-bedroom home at the site would cost around £700 to rent per month. However, objector Dr John Coyne said: “I think if a competition were held to decide the worst place to develop around Banchory in this way, this site would win. You are looking at a site that is within the confluence of two rivers. Julie Davis, treasurer of the Feughdee West Community Council, said: “The community has been consistent in its views on any major development south of the river. Objectors also voiced concerns that the 400 homes were a gateway for a future expansion of the area. Councillors will discuss the development, which is not in the local development plans, at the Marr Area Committee on May 5 before it goes to a meeting of the full council in June.